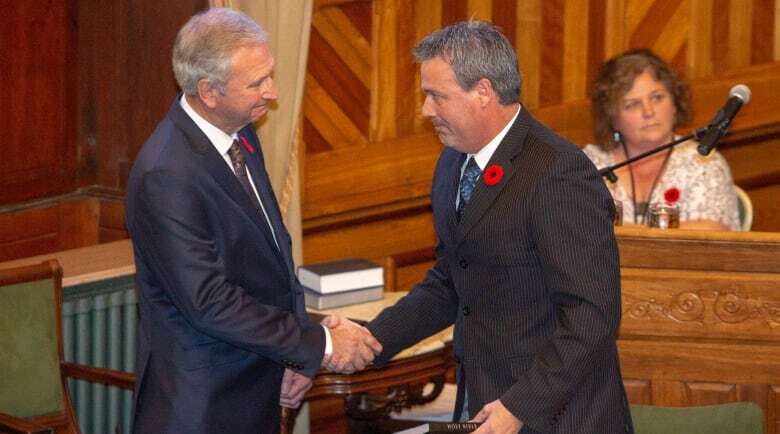 Blaine Higgs has become New Brunswick's 34th premier and has sworn in a cabinet that he says will get right to work solving the province's problems. 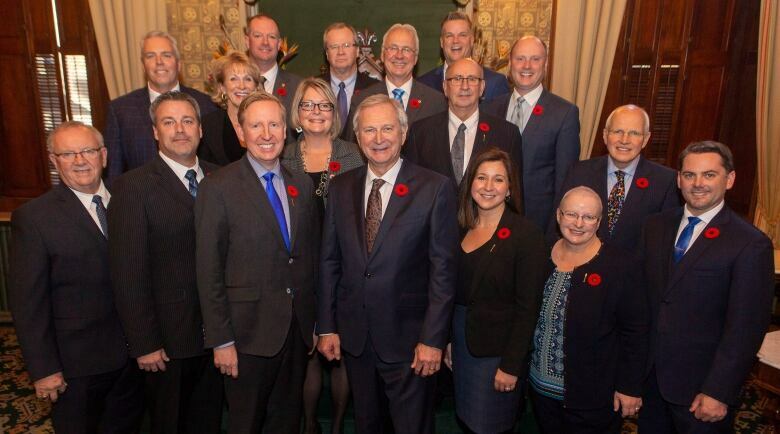 Higgs appointed 16 members to cabinet, including all four women Progressive Conservative MLAs, the party's lone francophone member as deputy premier, and a former leader of the NDP as education minister. It also sees the return of Ted Flemming as health minister, a post he held in the last PC government, and the promotion of Moncton Northwest MLA Ernie Steeves to the post of finance minister. In a speech after the swearing-in, Higgs put his cabinet on notice that he is serious about his promise to do politics differently. "I want each of you to recall my promise, made during the throne speech debate, that we would hold ourselves to a higher standard," he told his ministers. "When we are asked a sincere question, we will give a straight answer. When we are given a job to do, we will measure the results and share them without spin. When we make mistakes, we will humbly own them and work to do better. "When we defend our choices, we will do so with evidence and facts, not talking points and personal attacks. And we will always remember that results, not image, are the things that will keep the New Brunswick dream alive." 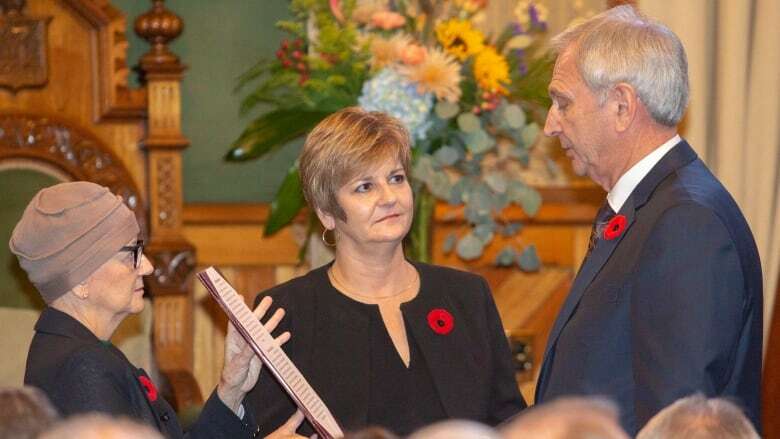 The swearing-in took place one week after Brian Gallant's Liberal minority government was defeated in a confidence vote. Higgs will also have to govern without a majority in the legislature. Higgs's choice of Steeves as finance minister comes just days after he acknowledged to reporters he was tempted to keep the job for himself. Higgs was finance minister in the previous PC government from 2010 to 2014. "I thought, 'Why couldn't I do both?'" he told reporters on Monday. "Let's just say it'll be good for me to be close to my finance minister." Conspicuous in their absence from the new cabinet were Bruce Fitch and Bruce Northrup, who both held senior ministerial positions in the previous Tory government of David Alward. One of the women appointed to cabinet, Andrea Anderson-Mason, brushed off questions about all four female PC MLAs becoming ministers. "I'm also a lawyer," she said. "Let's not forget that. I'm happy to be here and to be a woman in a cabinet position, but I'm also happy to be here as a lawyer as well." Higgs said the four women — Sherry Wilson, Dorothy Shephard, Mary Wilson and Anderson-Mason — will bring an important perspective. "Women need to be part of our democratic process," he said. "We can learn a lot from our colleagues and we need a diversification within our group to do that." Gauvin, the MLA for Shippagan-Lamè​que-Miscou, was seen as an inevitable cabinet choice after he was elected as the only PC MLA from a northern francophone riding. He said part of his job would be to work to repair language divisions in the province. "We have to roll up our sleeves, talk to each other, find ways to respect each other, and get the job done," he said. 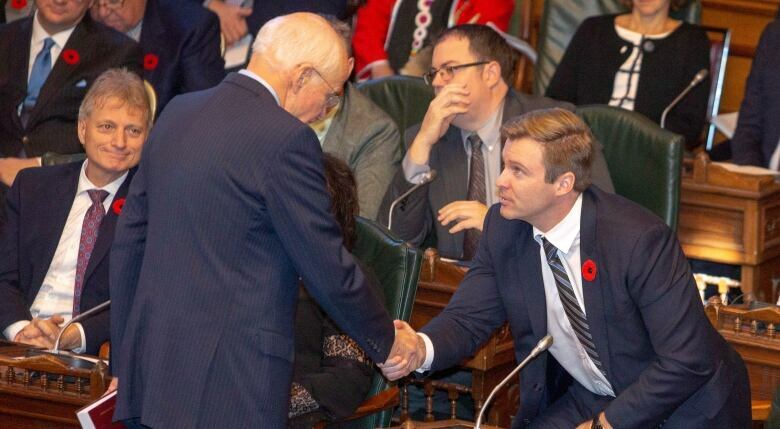 Gauvin said he wasn't bothered that office-space limitations in the anterooms adjacent to the legislative chamber led the Tories to have the three People's Alliance MLAs sit with them on the government side of the house. He said he has been urged by at least one francophone lobby group to get to know the Alliance members and better understand their opposition to some aspects of official bilingualism. Asked if the Alliance members were making similar efforts to understand him, he said: "Not yet, because we've just started speaking. They're not monsters. We'll start from there." Higgs also said there's no message in letting the Alliance members sit on the government side. "I would like to spend more time on the actual messages that are real, because of what we accomplish," he said. Among the immediate issues on the government's agenda is a fix for the shortage of paramedics and nurses, legislative changes to WorkSafeNB to halt spiralling rate increases paid by employers, and a clash with Ottawa on carbon taxes. Neither Flemming nor new attorney-general Anderson-Mason would comment on how they'll keep Higgs's promise to address the paramedic shortage and ambulance delays without running afoul of a consent order that requires bilingual service. "Today is not the day to discuss policy," Anderson-Mason said. Flemming said the consent order doesn't have the same weight as legal precedent but wouldn't discuss it much more than that. "I believe the matter should be resolvable if we put the best interests of New Brunswickers first," he said. Education Minister Dominic Cardy, who left the NDP last year to join the PCs, likewise didn't want to discuss whether the new government will undo the previous Liberal decision to return the French-immersion entry point to Grade 1. Higgs had criticized the Liberals for making the move before there was any evidence that the previous Grade 3 entry point was hurting educational outcomes. "Amazingly, having been sworn in less than an hour ago, I'm not going to be making policy announcements today," Cardy said. With his cabinet in place, Higgs will aim to bring in a throne speech the week of Nov. 20. It will face a confidence vote after two weeks of debate. The three Alliance MLAs have already said they will vote to keep the PC government in power for at least 18 months. That gives the PCs a total of 25 votes, a bare majority to pass legislation. The Liberals have 20 seats and the Greens have three. Speaker Daniel Guitard, elected as a Liberal, said Friday he will stay in the position for now — removing one vote from his party's benches — but will rethink if the PCs do anything that forces him to abandon his neutrality. "The day there's something that happens that will [prevent] me from being impartial will be the day I leave," he said. On Nov. 2, the house voted 25-23 for a throne speech motion amended by the PC Opposition to declare no confidence in the government. Three People's Alliance MLAs joined the 22 PC MLAs in voting to defeat the government. Meanwhile, 20 Liberals and three Greens voted to keep it alive. Higgs told reporters earlier that he wanted a speedy transition of power. "Our target is still on track for what we said in terms of a quick plan, a quick move to government," he said. The PCs hold 22 of 49 seats in the legislature. The three People's Alliance MLAs have said they'll vote bill-by-bill to keep the Tories in office for at least 18 months.